Cruise giant Royal Caribbean has temporarily shut down a trampoline attraction on some of its ships following an injury to one of its passengers. Casey Holladay was on board the Mariner of the Seas ship when he fell approximately six metres while on the Sky Pad bungee trampoline ride in February, after one of the cords snapped, according to multiple media reports. The Florida man broke his pelvis and dislocated his shoulder from the fall. Consequently, Holladay is suing Royal Caribbean for $13.9 million, having reportedly been suffering side effects from his injuries. 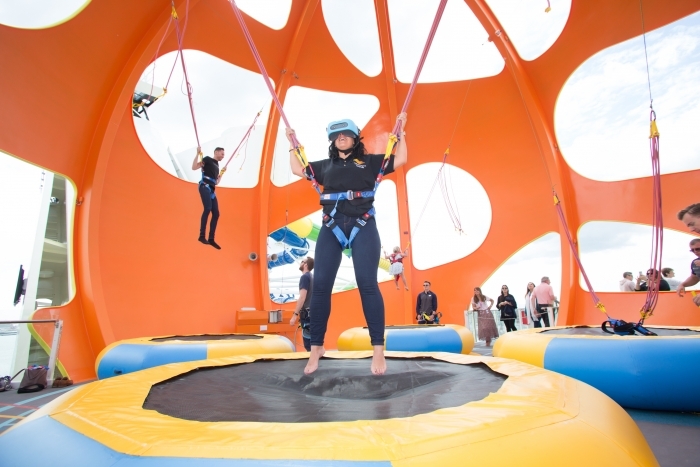 Promoted as an “out-of-this-world bungee trampoline experience”, Sky Pad gives people VR headsets to wear while they bounce around on trampolines, attached to a bungee harness. The ride features on Royal Caribbean’s Mariner of the Seas added as part of a a $139 million renovation last year), Independence of the Seas and Spectrum of the Seas ships. After being questioned by a customer about Sky Pad’s future, the company said it would be temporarily closing the ride on the Mariner of the Seas and Independence of the Seas vessels. Travel Weekly has contacted Royal Caribbean for comment. Have you noticed a few Royal Carribean employees looking a little sheepish today? Find out why here.